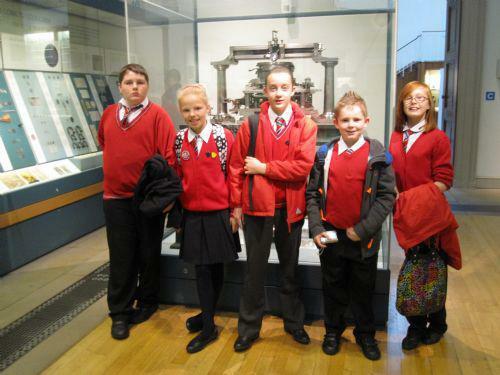 An enthusiastic group of Year 6 children experienced a day to remember as they headed off to London in search of the Mold Gold Cape. Paige, James, Aaron, Olivia and Niamh deseved their place on this special visit through their enthusiasm and interst in the hiistory of the Cape. When they were in Year 5 last year, the whole year group worked on a prestigeous project 'Cauldrons and Furnaces' which forms part of the Cultural Olympiad which leads up to the 2012 Games. 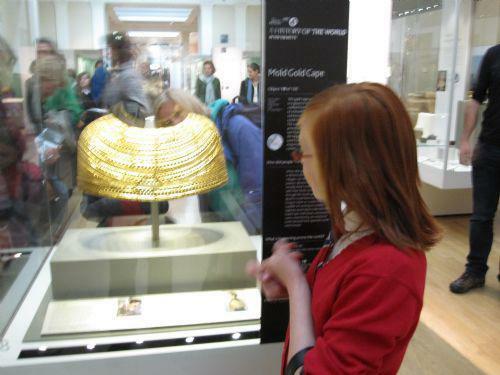 The project enabled the children to work with children from other schools in Denbighshire on the project which centred around one of Briatin's greatest archaelogical treaures the Bronze Age 'Mold Gold Cape'. The children met Ben Roberts, the World's top expert on the European Bronze Age, and Ben was able to give the children a personal tour of sections of the Museum. The visit to the Museum was filmed as part of a documentary. Link to Mold Cape Film - London November 2010 This film was made to show the children visting the Mold Gold Cape.